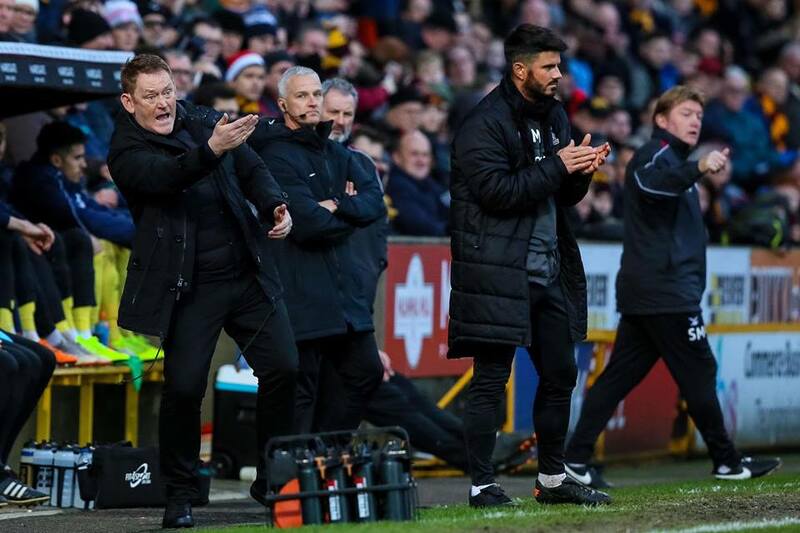 After a fortnight that has seen two heavy defeats, a fall back into relegation danger and low-key transfer activity, there are fears over how weak the foundations of Bradford City’s recovery actually are. The December revival in form has come to an abrupt half in the middle of January, and more worrying is just how poorly the entire team are performing. Players who were on top of their form suddenly look shadows of their confident selves. Heads have dropped, culminating in Saturday’s woeful collapse against Southend. If the Barnsley defeat can be partly attributed to the Tykes superior top five quality, what can be said about making a mid-table and out of form Southend side look like world beaters? It wasn’t so much the defeat, but the emphatic nature of the scoreline. The gulf between the two sides was stark. And that doesn’t bode well for City’s survival chances. Perhaps most concerning of all is the growing suspicion that the character of the squad is still lacking. When the Bantams went 1-0 down at Barnsley, a decent opening 28 minutes for the players evaporated into a meek surrender. Southend’s early goal on Saturday was initially met with a positive response from City, but self-belief drained all too quickly, especially after going 2-0 behind. It is a damning statistic of this team that not once all season have they fallen behind in the league and managed to recover sufficiently to take something from the game. Not a single point salvaged from a losing position. That is simply not good enough. And if it doesn’t change over the final 18 games of the season, it will relegate them. When form dramatically improved over December in particular, it felt like there was character in the squad – but in some ways it was an illusion. The truly successful teams have the ability to overcome adversity, not collapse over a set back. On Saturday, we saw the latter. And it led to a return of the bad old ways that we thought we’d left behind at the end of autumn. Manager David Hopkin has received a huge amount of post-match criticism for the sudden downturn in form. He is of course far from blameless. Against Southend, his decision to move centre half Nathaniel Knight-Percival to left back and leave left back Connor Wood on the bench raised eyebrows. But surely the players have a collective responsibility to do better? Leaving out Wood does not account for Hope Akpan’s feeble first half performance, Lewis O’Brien’s dip in form, Jack Payne’s desire to do too much on his own, George Miller’s failure to read what his team mates are trying to do. The huge intensity that City have been playing at over December, and the high pressing approach, have suddenly vanished from their play. The break after the New Year’s Day victory over Accrington felt welcome, as the players were looking jaded; but they’ve just not picked up where they left off. Perhaps it takes time to get your high intensity rhythm back, but time is not on City’s side. In a hugely competitive relegation battle, every game counts. Hopkin argued after the game that selecting Wood wouldn’t have made the decisive difference. I agree with that, to a point. Whilst Wood has shown promising signs of his potential earlier this season, even at his best he has made a lot of mistakes that were costly. Whilst it’s fashionable to criticise Adam Chicksen and we’d all agree a new left back is desirable, I think Wood’s development still has a way to go. Chicksen has made a lot of mistakes this season, but defensively the team has improved since he returned to fitness. Yet still, the problem with moving Knight-Percival to left back was what it did to the centre of the defence. Earlier in the season, the right-sided Ryan McGowan and Anthony O’Connor had played together with poor results. They do not look a comfortable partnership, and it once again proved the case on Saturday. Knight-Percival has actually been playing well of late, and taking him out of the centre of defence backfired. Hopkin has spoken about wanting to bring in another central midfielder, a winger and a striker before the window closes, and they’re badly needed. I’ve already argued that letting Jim O’Brien go could be a major mistake, and I’ve got reservations of trusting Akpan in the holding midfield role. He just lacks strength and was overrun by Southend’s midfield. A winger and another forward will also enable Hopkin to switch it around more, which is badly needed right now. Whilst a targetman is obviously needed, I’d love to see someone with pace too. Southend were able to play with a high defensive line on Saturday because they knew there was no one in City’s attack who could stretch them, and that made it very difficult for the Bantams to find any space. City’s lack of transfer business so far this window is a source of curiosity, given Hopkin’s previous comment that there would be reinforcements brought in from day one. I think it’s fair to say that the goalposts shifted since he aired those views, as the team’s late 2018 improvement suddenly reduced the urgency and probably changed some of the targets. Nevertheless, the addition of squad players only so far doesn’t do a lot to drive up the standards. Perhaps these two defeats will refocus minds. A picture is floating around social media of five City players training on their own – Josh Wright, Joe Riley, Alex Jones, Omari Patrick and Jordan Gibson. Hopkin has spoken more than once about his desire to move people on, and with the club reportedly on course to make a £1.5 million loss it’s obvious that there is a financial need for these players to find new clubs. In this climate, there’s a balancing act to be had. Hopkin and Julian Rhodes will presumably be working with a certain budget to strengthen, and that budget might be boosted if a Wright or a Riley were to leave. So do you sign a player now that the current budget allows you, or do you wait and hope that freeing up of funds enables you to bring in someone better? If not all of Wright, Riley, Jones, Patrick and Gibson depart, Hopkin will face a decision over whether to bring them back into the fold. Just like Guy Branston in the 2011/12 season, they may yet still have a role to play. As Southend eased to their third and fourth goals, Valley Parade emptied at an alarming rate. There had seemed to be a restoration of the bond between the club and the Bradford public, but it has been damaged once again. The post match criticism has been huge and the dark clouds have certainly re-emerged, but there’s still a long way to go. Hopkin was keen to stress that the club needs to move on from the Southend horror show – as fans, we must somehow do the same. Yes, it was very painful and completely unacceptable. But there’s a huge, huge fight on our hands here, keeping City in League One. And this is not the time to throw in the towel. What Hopkin needs to demonstrate, once again, is an ability to manage a football club on the downturn. Whatever our outcome come May, this will go down as a poor season for Bradford City. Whether the Bantams are in League One or Two next season, the team needs major work – but it must be carried out with a long-term focus. Since the play off final defeat in 2017, we’ve gone from having a settled squad of players who were at the club for years, to this turbulence of high turnover. Our recent history shows that this is not the route to success. In the most recent City Gent, John Watmough relays a conversation he had with Greg Abbott in early December, which included some interesting views from the club’s former chief scout. Abbott confirmed that Edin Rahic’s hesitancy in the transfer market caused the club to miss out on key targets. And he felt that even with last season’s decline, the decision to move on players like Timothee Dieng (offered a deal but on lower terms), Nicky Law and Romain Vincelot was a mistake. Abbott’s view was that even with these players starting to decline, it would prove very difficult to bring in replacements of better quality, within the budget. His advice was ignored, and in the end City signed inferior players on higher wages. Leaving us to where we are now. Watching Dieng boss Akpan on Saturday was stark evidence to support Abbott’s views. No one would pretend that Dieng, Law and Vincelot were world beaters, but we have a worse team now. There’s a danger that City are repeating the issues of the 2000s, when under-performing players were shipped out only to be replaced by players of inferior ability, who in time would be moved on and replaced with even worse. At best, all this transfer window can provide City with are sticky plasters to see us over the line. Come the summer, there’s a big job to do. It’s easy, at this moment, to urge Hopkin to rip up this squad; but doing a similar thing in the summers of 2017 and 2018 has contributed to where we are now. When City hit the post-millennium rock bottom of just avoiding relegation to non-league – the 2011/12 season, where Phil Parkinson had taken over at a similar stage to the season as Hopkin did this campaign – there at least emerged a spine to the team that was taken into the summer and emphatically built on. Andrew Davies, Nahki Wells, James Hanson, Will Atkinson, Luke Oliver, Ricky Ravenhill, Kyel Reid, Matt Duke and Jon McLaughlin. They would make history. If City are going to move onwards and upwards from their 2018 nightmare, they’ll need to develop a similar springboard between now and May. So Hopkin needs his players to step up now. Firstly, to keep Bradford City in League One – something that will not be easy. And secondly, by showing the right character, commitment and ability, these players can also hopefully show they have a role to play in the longer-term. That they can be part of the restoring Bradford City back to the club it should be. It would be miracle if we managed to stay in lge1 this season. It’s been total shambles since the day Edin Rahic entered the boardroom. I’m still not sure what type of football and strategy DH is wanting to play?. I understand paynes wages are now been payed in full by the club now …. Maybe this was not expected and as lowered the finances to such an extent targets DH wanted are to far way in terms of wages. Actually there are two more games this month! Burton away on Saturday 26/1/2019 and Shrewsbury at home on 29/1/2019! This article very neatly sums up my assessment of the state of Denmark (Bradford City)! The next three and a half months are going to be exceptionally difficult. How can you have harmony in the camp if you have five players training seperately from the rest of the squad? Are they all “bad apples”? In addition the young players were sold a dream but were, in fact, sold down the river and now find themselves kicking their heels, aimlessly training, with little hope of any real action. No reserve team games for those on the edge of the first team squad to press their case. What is the point in having Wood in the squad, when Hopkin doesn’t trust him to replace the missing first choice full back? We’ve seen the consequences, in the last two games, of shuffling the pack, rather than making the “like for like” choice. I’m not sure what the scouting network is, or whether Hopkin is solely responsible for talent spotting. However, two of the non contract signings have left the club and we’ve made two inauspicious signings in the window so far, which suggests nothing much has changed from the Rahic, in terms of quality. Even allowing for the disruption caused by Rahic, there are some disquieting things going on and this year’s “January of Discontent” can’t all be blamed on him. Regarding Lewis O’Brien, I mentioned after the game on Saturday that I thought the season was beginning to catch up with him. Understandable being so young and not fully developed physically. As good as he’s been, we can’t rely on an eighteen year old to carry us forward and get us out of this mess, on a weekly basis. A mobile combative and experienced midfielder is needed to assist. A total damning statistic; not rescuing one single point from a losing position all season, but I am still amazed that despite the winning run we had been on, confidence was still so brittle, that we can collapse after conceding the opening goal. One thing is for sure, if we don’t start showing more fight and belief when we go a goal behind, then we are gonna go down, simple as that. Two great opening goals by Southend, and we started to feel sorry for ourselves, thinking it wasn’t going to be our day, virtually giving up. We can’t afford to do that again, and need to show more fight to try and turn a game around. All 3 deals so far are loans or end of season only; Jim O Brien leaves because Notts County offers him a deal for next season only. Is this why we are struggling to bring good players in..its a worry that there is no longer term planning happening in this transfer window…. presumably a reflection of City’s financial position.